^ Wallison, Peter (2004), "Of loyalty, leaks, and the White House staff", in Wallison, Peter, Ronald Reagan: the power of conviction and the success of his Presidency, Basic Books, p. 151, ISBN 9780813390475. 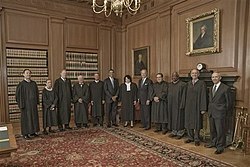 ^ Toobin, Jeffrey (2012), "Lawyers, guns, and money", in Toobin, Jeffrey, The oath: the Obama White House and the Supreme Court, New York: Doubleday, pp. 111–112, ISBN 9780385527200. Details. ^ Biskupic, Joan (2009), "Passions of his mind", in Biskupic, Joan, American original: the life and constitution of Supreme Court Justice Antonin Scalia, New York: Sarah Crichton Books/Farrar, Straus And Giroux, p. 185, ISBN 9780374202897. Preview. ^ Havill, Adrian (2002), "Mondays are for dead drops", in Havill, Adrian, The spy who stayed out in the cold: the secret life of FBI double agent Robert Hanssen, New York: St. Martin's Paperbacks, p. 120, ISBN 9780312986292. Preview. 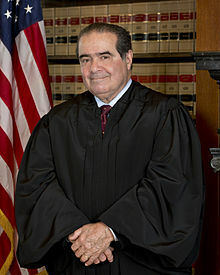 ^ "Stephen's Tribute To Antonin Scalia". The Late Show with Stephen Colbert. 2016-02-15. CBS. 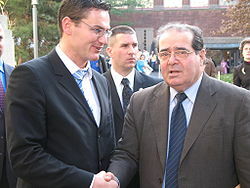 Scalia, Antonin (2004). Ring, Kevin, ed. 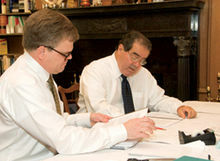 Scalia dissents: writings of the Supreme Court's wittiest, most outspoken justice. Washington, D.C: Regnery Publishing, Inc. ISBN 9780895260536. Toobin, Jeffrey (2012), "Lawyers, guns, and money", in Toobin, Jeffrey, The oath: the Obama White House and the Supreme Court (Hardcover ed. ), New York: Doubleday, pp. 111–112, ISBN 9780385527200. Details.